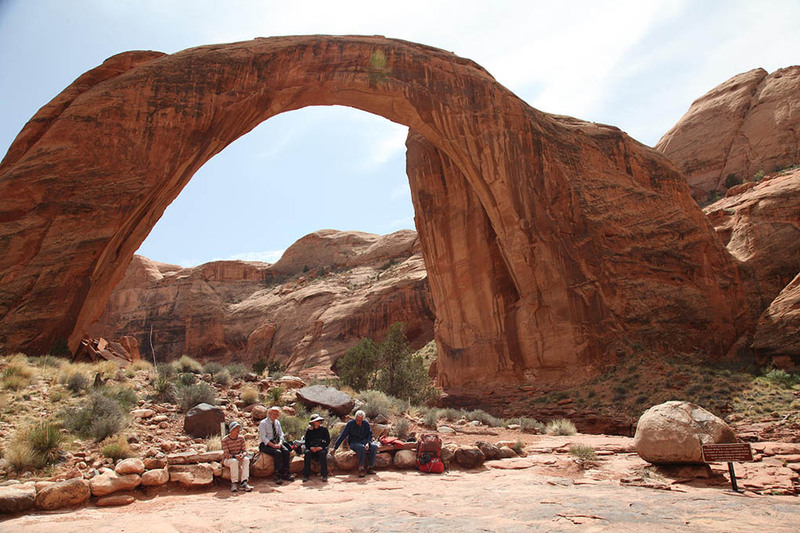 Director Alison Rose, second from right, and her astronomer friends take a break at the Rainbow Bridge National Monument in Utah. Majestic music, monumental landscapes, mighty telescopes, and millions and millions of stars and galaxies! Billions, actually, but I was enjoying the alliteration. You will find those things and more in the documentary film Star*Men. It’s a real treat. In addition to the sound and images mentioned above, you get human interest stories with historical significance. The 1957 launch of the Soviet space satellite Sputnik in 1957 caused serious alarm in the West. The other side in the Cold War had better technology – what might they do with it? There must have been some wounded pride, too, because Sputnik was right up there in the night sky for anyone to see. The U.S. did not have enough experts of its own and recruited scientists from all over the world to help it compete in this “Space Race.” The “star men” of the film’s title are Roger Griffin, Donald Lynden-Bell, Wal Sargent and Nick Woolf, British astronomers who were hired to work at the California Institute of Technology in Pasadena. As they explain, this was wonderful in so many ways. At that time there was little work in the U.K. for people with degrees in astronomy. They could leave the class system and the U.K. weather behind for sunny skies and open roads. 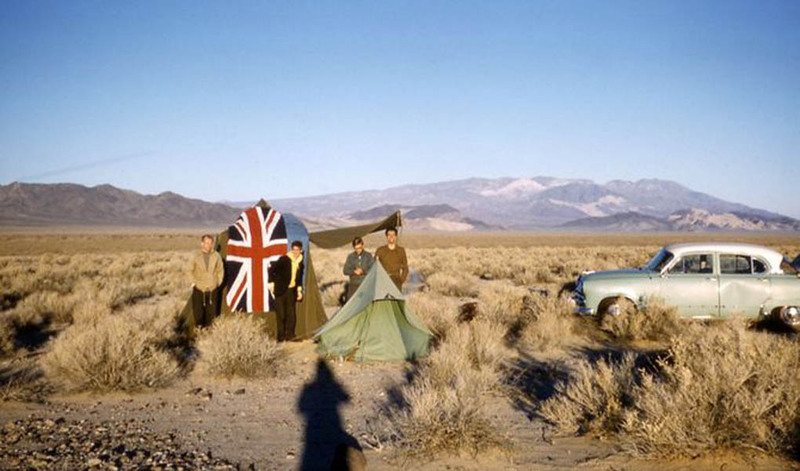 Photo taken by Roger Griffin in 1960 show his fellow astronomers at a their U.S. campsite with a large English flag. After they noticed the American fondness for their flag, they decided to take lots of photos with their own. All four made important discoveries in astronomy during their working lives. In time two returned to the U.K. and two found other jobs in the U.S. Beside explaining their accomplishments, director Alison Rose takes us along when the four have a reunion, 50 years after their arrival in California, that includes much fascinating talk and some very strenuous hiking, including a visit to the Rainbow Bridge National Monument in Utah. And they wear huge backpacks while doing it, too! The cinematography of Star*Men is exceptional – natural landscapes and the views of star galaxies and nebulae are stunning. The music is great, too. Director Alison Rose will attend the screening and answer questions afterwards. 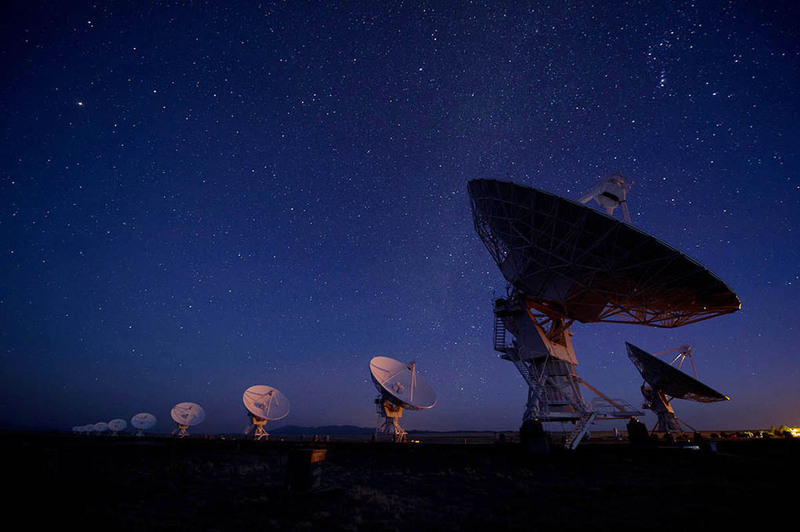 The Very Large Array, an astronomical radio observatory in New Mexico. Do they look like giant ears to you? (Malcolm Park photo from Star*Men web site. Star*Men, Monday, Nov. 16, 2015, 6 p.m.
Cinémathèque Québécoise – Salle Claude-Jutra, 335 de Maisonneuve Blvd E.